FHSCB@Vets 2009 - Part 1 from Fairbanks Band on Vimeo. FHSCB@Vets 2009 - Part 2 from Fairbanks Band on Vimeo. You made the front page of the paper on Wednesday! The whole world (well, Union County anyways) knows about Friday's concert. See you all there. This is a reminder to all the FMB members that details for Monday were posted like a long time ago. Click here to get all the news. BTW, if you forgot anything like your instrument or parts of your summer uniform the school will be open at 8 a.m. on Monday. 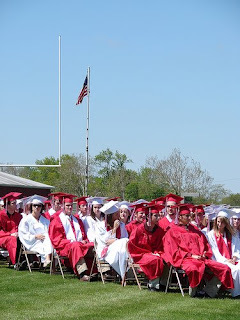 Pictures from the 2009 FHS commencement exercises have been posted on the official picture page. Thanks to everyone for fine performances and for making it such a lovely day. Thanks also to Josh L. for helping me pick up and pack all the stuff. Congratulations, seniors! You are certainly appreciated and you will be missed. Congratulations to Victor Fisher, senior band member, who was awarded the John Philip Sousa Award for Band this morning at the Fairbanks High School awards assembly. Victor was chosen by his peers as the outstanding four year member of the group for his musicianship, leadership, and contributions to the group. 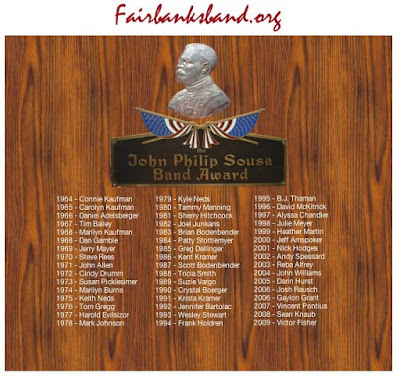 You can visit the J.P.Sousa Award page on Fairbanksband.org to see his name on the virtual plaque, as well as past winners of the award. Fairbanks Spring concert 2009 from Fairbanks Band on Vimeo.My apologies to FHSCB members: I used a new camera and it ran out of storage space before you took the stage. I will be recording our FHSCB @ Vets performance and post it instead. 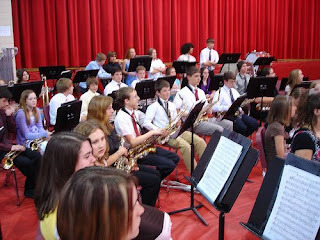 Pictures from the Spring concert are on the official picture page. I hope you enjoy them. Thanks to everyone for a great concert tonight! Get here at 6:30. You need to be in the high school cafeteria ready to warm together at 6:40. Please leave your cases in the band room. Mr. Keller will be back to get you to perform at about 7:15. After we perform, we will stay in the gym. Take your instrument with you, or put it on the stage. Do NOT go back to the band room until after the concert is over. You need to sit with your family for the remainder of the concert. 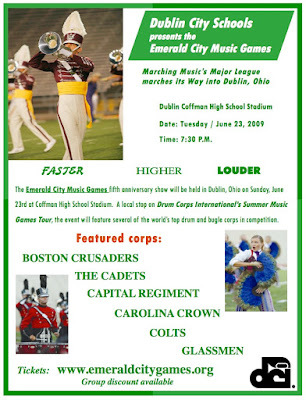 This is just a quick note to 2009 FMB parents and students about pre-camp rehearsals July 21-24. These dates are NOT optional. They are required rehearsals and are an integral part of preparing for the season and for band camp. Please be there. I'm usually not one to ask for your donations for philanthropic organizations other than my own. 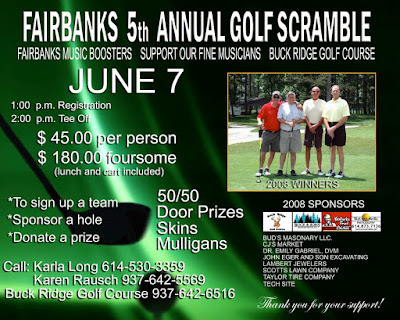 You know that if I ask you for money, I would rather it go to benefit our fine Fairbanks musicians! Band/Choir Seniors: You are being featured in the Spring concert program. Please get a brief write up and a photo to Mrs. Garwood ASAP. You can email the text and a scanned pic to her at marylng@skylightmedia.net. Please get this in no later than May 13. Thanks! FHSCB @ Vets - Poster! 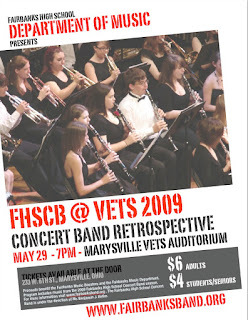 I have published the poster for the 2009 FHSCB at Vets concert. Please help me advertise by placing posters in workplaces, churches, and on community bulletin boards. You can even download the full-resolution version (6.3Mb) and print for yourself, or to put up wherever a poster needs to be seen! Help spread the word about this BIG year-end event. Are you interested summer lessons to improve your skills as a musician? Do you want or need some one-to-one attention? Are you ready to take your musicianship to the next level? Marcia Casciere is the band director at Ridgemont High School and lives in Marysville. 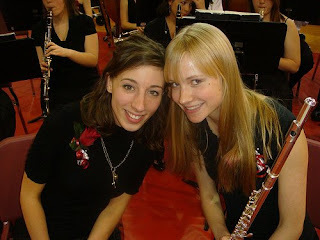 She plays bassoon and saxophone, but teaches lessons to any woodwind player. You can contact her at mcasciere@gmail.com. If you prefer to contact her by phone, drop me an email and I would be happy to give you her phone number. Private lessons are THE best way to take your playing to the next level. I hope you might choose to take the plunge. 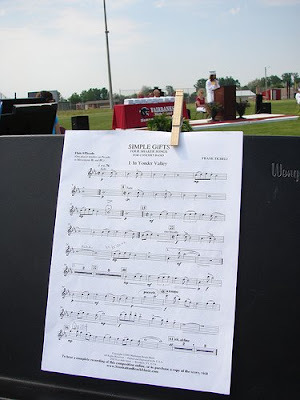 May 19 is the date of the Fairbanks Music Department's annual Spring Concert, which features band and choir students from Fairbanks Middle and High Schools. Performing groups will include the fifth grade band, sixth grade band, junior high concert band, high school choir, and high school concert band. The program will include pieces by Anne McGinty, John Edmonson, Louis Elebel, John Williams, Steven Flaherty, Steve Reineke, Frank Erickson, Frank Ticheli, and Michael Colgrass. The concert begins at 7 PM and is free and open to the public. Attendance is required for performers. Middle school students are to wear nice clothes. No jeans or tennis shoes are permitted. Gentlemen need to wear a tie. If ladies choose to wear a skirt, it must cover the knee when seated. High school members are to wear concert black. Gentlemen are to have their tux shirts clean and pressed. A detailed schedule of the concert will be available next week! 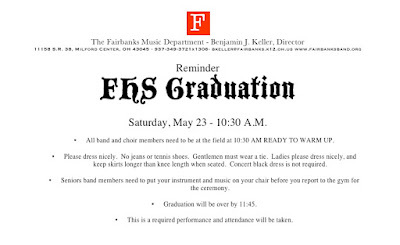 Fairbanks High School's annual commencement exercises are on Saturday May 23, and the concert band and choir are featured as we bid farewell to the class of 2009. 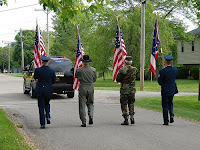 The ceremony begins at 11 AM at Kyre Field on the campus of Fairbanks High School. Musicians are to be ready to warm up at 10:30. Attire is nice spring clothes. No jeans, no tennis shoes. Gentlemen need to wear a tie. Ladies skirts are to cover the knee when seated. There are no color restrictions for this performance as it is usually sunny and steamy. Graduation is over at 11:45. Bonus points are available for set up and tear down volunteers. 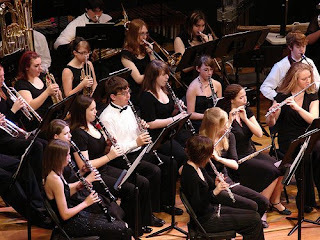 The Fairbanks High School Concert Band will present it's annual year-end retrospective concert at Veteran's Auditorium in Marysville on May 29 at 7 PM. 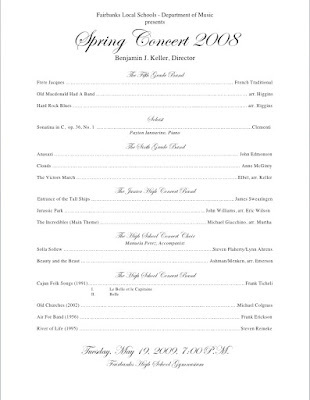 The program will include music from the entire concert season, and feature the band and select soloists. It is an opportunity to wrap up the year in style and have a performance in a real auditorium on a Friday night. Tickets for this concert are $6 for adults, $4 for students and senior citizens, and children 5 and under are free. Spread the word to your family, friends, and neighbors both in the Fairbanks AND Marysville communities. 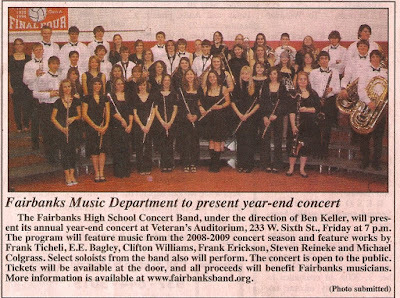 Help us bid farewell to the seniors and wrap up another successful year of the Fairbanks High School Concert Band!